Here's what you need to know about norovirus, also known as the stomach flu. Nearly 300 guests have been sickened with a stomach virus aboard a Royal Caribbean cruise ship, a spokesperson said. 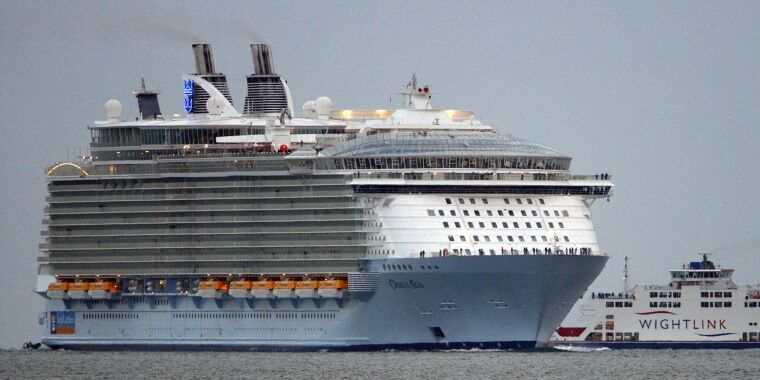 The cruise line's Oasis of the Seas ship had been on a seven-night cruise to the Caribbean and will return to Florida on Saturday, a day earlier than expected, the spokesperson told NBC News. Nearly 9,000 guests are aboard the ship and all will receive refunds, the company said. A total of 277 guests and crew members have the gastrointestinal illness. They're being treated with over-the-counter medication by the ship's medical team. The spokesperson identified the illness as the norovirus, an infectious disease also known as the stomach bug, stomach "flu" or winter vomiting disease. However, norovirus is not related to influenza. It's a notoriously contagious and a difficult-to-prevent gastrointestinal virus. If someone near you is sick with norovirus, prepare yourself. Symptoms can come on 12 to 48 hours after exposure. It can make you feel extremely sick with diarrhea and vomiting, many times a day. It is commonly known as stomach flu or winter vomiting disease. Both infections cause abdominal cramps and diarrhea, and often fever. When the virus hits, it often causes huge outbreaks — for instance, 700 people sickened on the Royal Caribbean ship Explorer of the Seas in January 2014 or 142 people infected on a Royal Norwegian cruise ship. E. coli outbreaks often play out over a longer period of time and the numbers reported are usually much lower than actual cases. Each year, the outbreak makes 70,000 people sick enough to go to the hospital. As many as 800 people die, mostly elderly patients who become dehydrated. It’s the most common cause of foodborne-disease outbreaks, CDC says. Researchers who put together a “vomiting machine” demonstrated one reason why. The violent vomiting that marks norovirus sends small particles of that vomit into the air, carrying pieces of virus. "We think that there's a at least a million particles released in a vomiting event and maybe more,” said Lee-Ann Jaykus, the N.C. State food science professor who leads that research. “Imagine you have a food handler who uses the bathroom and they haven’t washed their hands thoroughly." People can be infected with as few as 20 to 1,300 microscopic viral particles, so their study shows that vomiting could indeed spread the infection through the air. And the findings help explain how a batch of teenaged soccer players got sick from eating packaged cookies in Washington state in 2010. One of the girls had thrown up in the hotel bathroom, spreading an aerosol of the virus that landed everywhere, including on a reusable grocery bag hanging in the room. The bag, which later was used to carry the cookies, tested positive for the bug two weeks later. Norovirus is hard to wash away. Studies show a quick application of hand sanitizer won’t get rid of it, and most people don’t wash their hands properly, either — it takes about 30 seconds of vigorous rubbing using hot water and soap to wash away the tiny bits of virus, and that means getting under the nails, too.